Tempted as I am to frame this piece as a review, I really don’t think there’s much point in going down that road. I’m a day late and a dollar short to be an effective dissenting voice the big Bioshock Infinite love-in. Be that as it may, I spent a weekend of my life on this game, and I feel compelled to offer up a few words on it. In short, Bioshock Infinite is a big dumb game. Note that I am choosing my language quite intentionally. Dumb does not mean that Bioshock Infinite is terrible. In fact, Bioshock Infinite is one of the most attractive looking games I’ve ever played. It’s level design is artfully three-dimensional, best demonstrated when a player is zipping around Columbia’s monorail in the clouds. Beyond that, Bioshock Infinite is surprisingly dumb. In fact, I think there’s a measure of inverse proportionality in play within “x-Shock” games; wherein the intelligence of a given game’s design and story decreases as its art quality increases. System Shock and System Shock 2 might look every bit their age, but they boast a richness in game play and story that is utterly absent in Bioshock Infinite. That’s right I’m talking about System Shock. I’m a 32-year-old gamer who thinks that new games could learn a thing or two from the 90s. I make no apologies for that, as I am right in thinking this. Where the System Shocks presented combat as a last resort, so much so that gunplay required devoting resources to maintaining a weapon, Bioshock Infinite is a typical run and gun shooter. Whatever RPG elements remain from the past games are little more than recessive genes that limit upgrades for cyber-rig powers plasmids vigors to transactions with hackneyed vending machines. Bioshock Infinite even borrows a page from that most common of all shooters, Call of Duty, in limiting a player to two weapons. Moreover, attempts to maintain the atmospheric experience common to both System Shock 2 and the original Bioshock simply don’t work in Biosohck Infinite. Consider that the audio recordings in SS2 and Bioshock worked because the player was quite often alone. Rapture and the Von Braun were dead places, haunted – not populated – by alien zombies and insane extras from Eyes Wide Shut. Columbia is very much alive, and it’s hard to build a sense of believable tension when every NPC that isn’t shooting at a player for being the Great Satan False Sheppard is rattling on about keeping the Jews, Slavs, Slanties, or Injuns in their place. So sorry, Irrational Games, but I can’t buy into the sincerity of the recordings as a narrative tool when they keep getting interrupted with the sound of an entire development team patting themselves on the back for “getting” race in America. If you want to “get” race in America, write a book, not a game that rewards you with money for shooting the racists and religious fanatics of the Third Great Awakening. At least the previous games had the good sense to keep their narratives focused on a single theme. System Shock and System Shock II connected to early narratives of post-humanism and rampant AIs that were very much in vogue in the 80s and 90s. In fact, System Shock II took it a step further; wherein SHODAN, the insane antagonist AI, created a new form of organic life and sought to protect it, like any other mother. How odd that her “perfect beings” would be meat-life life despite her hatred for humanity. Bioshock introduced a generation of gamers to Ayn Rand, one of the four horsemen of 20th century political thought. Wandering around the ruined remains of Rapture, hearing Andrew Ryan – get it, kids? – talking about parasites, bootstraps, forced atheism, and sweat-of-one’s-brow took Rand’s worldview and applied a healthy dose of reducto ad absurdum and art deco. It was self-serious satire mixed with a compelling environment, and reasonably good game play that catalyzed an ongoing discussion on morality and moral choices in video games. Can we say the same about Bioshock Infinite? No, we can not. 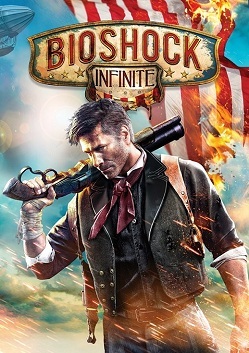 The story of Bioshock Infinite, which is the only reason to play this otherwise mediocre FPS once you get done admiring the art, is about as impactful as Fight Club as directed by M. Night Shayamalan. To put it another way, Bioshock had a thesis and a clear objective. 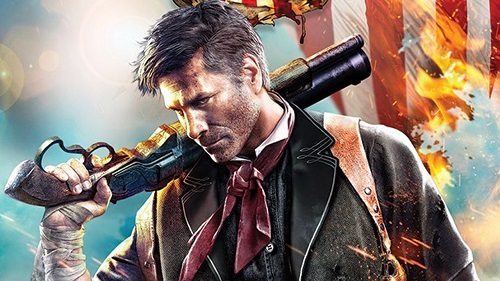 Bioshock Infinite is a history paper written by a first year undergraduate who wants to explore 50 years of American history in 1500 words with only secondary sources; it might pass, but it’s a C- at best. Ken Lavine would have done well to read a little Upton Sinclair before he sat down to write Bioshock Infinite. At least that would have anchored the game in something that can be parsed within 8-10 hours. Then, as if to heap design insult upon narrative injury, the once layered and complex auto map of System Shock II, a tool which forced players to learn the nuances of their environment as they moved from one game area to the next, is replaced with a magic arrow that always points the player toward their objective. Forgive me for quoting Gob Bluth, but, come on. Were there really that many complaints about being lost in Bioshock and Bioshock II to merit this “push button to derp” add-on? If the developers think the audience is that feeble minded, then why not make the whole game a rail shooter? And while we’re asking hypothetical questions, what happened to morality and choice? If Bioshock was about a player’s freedom to decide their own fate, rudimentary as it was, one would expect Bioshock Infinite to expand on that mechanic. Instead we’re presented with a protagonist who has absolutely no agency over his own story. I suppose this is well enough in a book or film, but this is a video game. No matter how well a person plays the game, Booker still suffers the same fate. Shouldn’t the revelation of a multiverse lend itself to the player choosing Booker’s ultimate path to redemption or purgatory? It is for all these reasons that I genuinely ask, “What’s the big deal?” Bioshock Infinite is pretty, but compared to System Shock II and Bioshock, it’s lacking in both story and game mechanics. The narrative might have flashes of cleverness, like when a rift opens to show a French theatre screening Return of the Jedi by its rejected Revenge of the Jedi name, but they come together in a way that is simply unsatisfying. Gone is System Shock’s freedom to explore. Gone is the morality and critical/literary narrative of Bioshock. All that remains in the ruins of its fore bearers is a shooter that alternates between being pants-on-head easy and pointlessly hard, but at least it looks good, right? Also racism, because…racism.